Dali (大理; Dàlǐ) is a city in Yunnan Province in China famous for its old town and handicrafts. Dali is a popular tourist destination for domestic Chinese tourists, one of the string of towns described in Yunnan tourist trail leading up to the beautiful Tiger Leaping Gorge. It is a medium-sized city of 650,000 but its tourist draw is the "Old Town." （大理古城). Like many Chinese tourist destinations, the old town, which has architecture that dates back to the Ming dynasty, has been extensively renovated, rebuilt and modernized, including newly constructed city walls and gates. You can still see the remnants of the old wall in the form of long mounds that surround the old city, but Dali is no longer a walled city by any means. The old town section of Dali is sandwiched between two multi-lane highways. While it lacks the authentic rustic charm of other old Chinese cities (e.g. Pingyao or even Lijiang) and much of the old town has been renovated and is devoted to tacky knick-knack stores for Chinese tourists, it does sit in the shadow of a beautiful mountain range, the Cangshan and is close to the large Erhai lake. There is an expensive cable car (¥90) that you can take to reach the top and there are some hiking paths that offer beautiful views of Lake Erhai. But do not expect to find a small ancient city in the beautiful mountains of Yunnan. This is not what you will get. Dali is very spread-out and it takes almost an hour by bus #8 to get form the train station in the modern part of town to the old town. The rest of Dali is filled with modern buildings, 20-story residential towers, and a Wal-Mart. You can also see factories belching emissions on the other side of Lake Erhai. In 738 the Nanzhao Kingdom was established; the original capital of the Nanzhao Kingdom was located in Weishan (within Dali Prefecture) and later moved to sites around Erhai Lake. The territory conquered was quite substantial; covered a large area of Yunnan and northern Burma, and parts of what are now Sichuan and Guizhou. The kingdom survived almost 200 years and had 13 kings before collapsing. After several decades of chaos the Kingdom of Dali emerged in 937. The Kingdom of Dali established by Duan Siping in 937 was controlled by the Duan clan and survived until conquered by the Mongols about 300 years later. The Kingdom retained a close alliance with the Tang Dynasty, and was one of the major transit points for the introduction of Buddhism throughout the rest of China. By 1000, Dali was one of the 13 largest cities in the world. The rulers of the original Nanzhao Kingdom were probably precursors to the modern Yi peoples, while the Kingdom of Dali rulers were precursors to the modern Bai minority. Many local people in Dali have the surname Duan to this day (rare in other parts of China). These historical events are immortalised in the Martial Arts literature of Hong Kong author Jin Yong (read by every Chinese school kid), giving Dali a fame nationwide. The Nanzhao Kingdom and the Kingdom of Dali had a military alliance with the Tang Dynasty against the aggressive Turfan (Tibetan) Empire which made regular and aggressive incursions into their respective territories. A huge memorial stele to the Pacification of Kingdom of Dali was built during the Ming Dynasty and remains standing at the end of Sanyue Street past the city's West Gate. Entrance is free. The Mongols destroyed the old capital and palace of the Kingdom of Dali, just to the south of the Three Pagodas. Almost all records of the Nanzhao and Dali Kingdoms were burnt or destroyed, leaving much unknown about these periods. In addition, the Mongols brutally displaced many of the inhabitants of the prefecture, with the result that Bai minority people were forced as far east as Hunan Province. Many ethnic Han also moved into the Kunming area during this period. The old Dali City was rebuilt in the early 1400s by the Ming Dynasty. What you see in Dali Old Town today is the rebuilt Ming town. Since then, the fortunes of Dali have declined and its importance as a cultural and economic centre in the Yunnan area have been overtaken by Kunming, the provincial capital. 1856-1872 Dali was the headquarters of the Panthay Rebellion led by Du Wenxiu. That rebellion commenced as an uprising against local oppressive rulers by the Hui Muslim minority and ended as open rebellion against the Qing Dynasty. The Palace of Du Wenxiu is on Fuxing Road and serves as the local museum (the museum exhibition on the rebellion paints it as a patriot workers revolt which it was not). The rebellion was brutally crushed by the Qing and hundreds of thousands of Yunnan Muslims were killed in revenge. Buses from Kunming West Bus Station take about 4½ hours and cost around ¥100 for an ordinary bus (as of July 2019) and around ¥130 for an express luxury bus, and will bring you to Xiaguan (Dali New City). Some buses go to Dali, too, so check with the driver. There are three different bus stations in Xiaguan. From nearby the bus station you should be able to take bus 12 (¥2 as of July 2019) and then transfer to bus 8 (¥3 as of July 2019) or bus 4 (¥2), 45 minutes (approx. 18 km) to Dali Old Town 13 km to the north (Bus 4 also runs through the town). It's also possible to catch a white mini-bus on Jianshe Lu that run between Xiaguan and Dali, there's usually a white sign displayed inside the front wind shield that reads (大理<->下关) in Chinese. The cost for the mini-bus is ¥3 per person. Taxi fare between Xiaguan and Dali should be around ¥40. If the expressway is closed or under construction the bus may take the more scenic route akin to the notorious "road of death" in Bolivia, though paved. Buses coming south from Lijiang are about ¥60-80 and stop outside the old town, from where it is possible to get a taxi or walk to the main guesthouses. You can save about ¥20 on the Lijiang bus by hailing one on the highway east of the old town. There is a bus service to Xiaguan from Jinghong, Xishuangbanna prefecture, which has buses running at 17:00 and 21:30, possibly earlier too. The ticket price is ¥195 and the journey was about 17 hours. The bus used on this route is a sleeper bus so you get a fairly comfortably bed and a blanket. This service may be useful for people who have arrived in China from northern Laos, e.g. Luang Namtha. The number of slow train connecting Kunming to Dali is getting very rare. Bullet trains leave from Kunming to Dali train station (in Dali New City) every 30 minutes, and take two hours to reach Dali, running at speeds of up to 200 km/h. Tickets cost around ¥145 (as of Jul 2019). Once you arrived in Xiaguan, take bus 8 to the old town for ¥3 from just outside the station, terminating near the North Gate. Another bus route named Chongsheng Tree Pagodas（崇圣寺三塔 in Chinese characters） also goes to old town, passing by West Gate. Night trains from Kunming to Dali have been cancelled. There are also 8 trains daily from Lijiang to Dali and back. The ride takes nearly 2 hours. Cost is ¥34 for hard seat (as of July 2019). Your carriages might be hard sleeper cars, but you are not allowed to lay down as the sleeper is shared for four passengers. Dali airport is to the east of Dali New City, about 45 minutes drive to Dali old town. There are no airport busses. Taxis are waiting but cannot always be trusted to take you to the guesthouse or hotel you want to go to as they get commission at a lot of hotels. Better book an airport pick-up with the hotel you booked. Depending on the time of year you can get discounted tickets (around 400 yuan one way Dali-Kunming) but you will need to book well ahead. Full price is ¥750 (¥680 + 70 airport tax, Nov 2009). From major Chinese cities (Beijing, Shanghai, Guangzhou) it is possible to book a flight to Dali but always with a stopover in Kunming. Best discounts apply to tickets booked 15 days or more in advance. Or, you can go to Kunming Wujiaba International Airport by plane. It is in the southeast of Kunming, the capital city of Yunnan Province. (It is one of the most important and the busiest international airports of China.) You can then take the Airport Shuttle bus from Kunming airport. They operate 06:30-22:00 (Beijing time). Dali Old Town is small enough to get around on foot, and being laid out in a grid format it is relatively easy to navigate. The major landmarks are the South and North Gates with Fuxing Road running between them, and Yangren Street (Westerner's Street) lined with cafés and tourist shops. City maps are readily available for around ¥5 but tend not to follow the usual north-at-the-top standard because the natural orientation of someone in Dali is to look towards the huge looming Cangs Mountain which run north-south next to the city. As you look at the mountains and face west, the lake is at your back, or east. This method of orientation makes even more sense when you realize that the entire town gently slopes from the mountains to the lake, making those two landmarks a natural way to find your bearings. Bikes are also available at many guesthouses and rental huts around town and cost ¥5-40 per day. Bikes vary greatly in quality so shop around for the best deal. The Chinese brands Merida and Giant are among the better ones to consider. Electric scooters and electric micro cars (smaller than a Smart) seem to be license-less, hence available for renting, no driving license required. E-scooters seem to go for as many yusb as the range of the battery (¥60 for 60 km, ¥80 for 80 km and so on). The e-car seems to go for about ¥140, and has a range of 100 km. The e-taxis in Dali Old Town generally cost ¥5 for under 3 km (though most drivers will ask for ¥10). For other locations outside the old town, all prices are negotiable. A taxi to Dali New City will cost around ¥40. In addition to the Old Town, Dali is a Prefecture of over 10,000 km2. A whole range of destinations exist within the Prefecture that are perfect for the adventurous traveller. All are relatively easily accessible from either Dali Old Town or Dali New City, the major city 13 km to the south. A lot of useful information is available from the cafes within the old town on day trips around the prefecture. riding a horse or walking up (1½ hours) to Zhongho temple from the city (from the gate across Ren Min Lu street). Second, the 3700-m altitude that hosts Horse Washing Pool. To reach here, you can use the cable car from Dali Tianlongbabu TV City or use cable car in direction of Gantong Temple and walk the Cloud Traveler's Path for around 3 km until you find a chairlift service and then take chairlift to Horse Washing Pool. The northern route of 6 km of path offers one of the sharpest cliff views of the entire Dali valley, and on a clear day you can see Jizu Mountain well beyond Erhai lake. At the bend in the main valley it also offers a path up the mountains for 2 km which ends at a mountain pool where you can take a swim on a warm day. The southern route winds down for 11 km through a few valleys to Gantong temple. This hike will lead you to most of the sights mentioned below and will take 4–5 hours. You can even turn this into an 8 hour hike if you continue southwards Xiaguan along good paths (with several early exit points down the mountain) and enjoy the spectacular view. A suggested route would be to hike to Zhonghe Temple (by walking or riding horse), take the northern path for 3 km enjoying the clearest view of the entire valley, then head back south past Zhonghe Temple towards Gantong Temple. You can buy refreshments at the temple, so take a break, then keep walking the full 11 km until you reach Gangtong. If you are not up to the full walk, you can exit the mountain about 3 km past Zhonghe Temple down a well made stairway behind Dali Tianlongbabu TV City. If you are planning to get down using cable car at Gantong Temple, make sure you reach there before 16:30 (the cable car service closes at 17:00 but they may close earlier than that), otherwise there is a path to climb down (even though the map on your ticket only shows that the only way to get down is by cable car) to get back to city for about 1–2 hours hike down. Entrance to the Mountain Park costs ¥30 and the cable car from/to Gantong Temple: ¥80 round trip or ¥50 one way. A taxi to/from Gantong temple (about 8 km south of the old town) is ¥30. If you are particularly dedicated, you can gain an access (also ¥30) to the mountain by taking a longer route behind the One Pagoda (follow the stone road) and up the stairway behind the Dali Tianlongbabu TV City. Foreigner Street (洋人街) In the ancient city of Dali," the road" in the beginning of Yunnan people against Yuan Shikai proclaimed himself Emperor, named after the war of asylum. The road east-west, 1000 meters long, 7 meters wide, green stone pavement. Dali of Foreigner's Street is on the road in the West Dali section. City Wall: Take a walk in Dali Old Town's city wall for an elevated view on the town. Access from the Southern Gate. Wuhua-Tower (五华楼): Climb the stairs to the old gate-looking tower for an nice view. It's in the center of the pedestrian street of Dali Old Town. Entry free of charge. The tower is in accessible (as of July 2019). Erhai Lake Villages (洱海湖山庄). There are 17 villages spread along the Western shore of the Erhai Lake between Xiaguan and Xizhou. Take a tour by bike by riding East from Dali Old Town until you reach the lake in Caicun Village and then North beside the lake shore taking local paths and roads. A great opportunity to see village life at its best, meet locals, see the Banyan trees in each village square and admire local architecture. There are 3 Qing Dynasty bridges along the route. 25.763333100.18751 Erhai Lake. Visit Guanyin Temple and several islands. Go with a group and enjoy a great day out. Boats can be easily arranged as the owners come into town to drum up business and you can see what you are getting from the photobooks they carry. Ferry rides at real stations cost around ¥30. There are signs indicating that fishing boats and paddle boats can't carry tourists, although it is unclear what the definition of tourist is. A ¥30 entrance fee is charged for lake visits, plus ¥50-100 per person for a day. Butterfly Spring (if you really want to see this you can catch a minibus from outside the west gate). A shallow pool that periodically swarms with countless butterflies. Otherwise the site includes a fairly nice park, a small butterfly breeding centre and an utterly bizarre exhibition hall with various pictures made from hundreds of dead butterflies of different colours which were presumably raised and killed on-site. There have been no butterflies since at least 2009 because of pollution.) ¥60. Wase Market. Combine a trip to Erhai Lake with a visit to the Wase Market on the eastern shore of the lake. Wase is a traditional and conservative Bai town with a weekly market aimed at townspeople and nearby farmers. The market offers an interesting look at life in a quiet country town. 25.708444100.1459722 Tang Dynasty Three Pagodas (10 minutes by bike to the northwest of Dali Old Town (next door to Three Pagodas Hotel)). Offering one of the best preserved Buddhist structures in China. However, the compounds behind the pagodas were destroyed during the 1920s earthquake and later in the Cultural Revolution and were rebuilt starting in 1986. The Central Pagoda is almost 1200 years old and represents a period when Dali was a Buddhist Kingdom. The Congshen Temple behind the Three Pagodas has been rebuilt and reopened, after deteriorating in the 20th century due to earthquakes, fires and the Cultural Revolution. 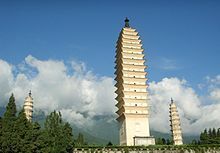 It is a massive complex that continues far up the mountain, where a climb to the top of the pagodas rewards with a beautiful overlook of Dali Ancient Town and Erhai Lake. Worth a visit for the Tang architecture, numerous statues of the Buddha and Guanyin with influences from both India and China, dragon fountains, and two small museum showcases. ¥75 (student ID gives a 50% discount). Shaping Market (about 30 km north of Dali). Shaping Town offers a lively weekly market with plenty of local color. The market starts early. A great chance to see local farmers out in force and literally watch plenty of horse trading. Not much to buy (unless you are a farmer) but gives you the feeling of life in a small country town. Eryuan (West of Dali). Eryuan is a small town next to Cibihu lake. After taking a bus that leaves every hour for ¥13/person from the intersection with 214 National Road near the North Gate market you can get off in Eryuan town or anywhere along the way. If the bus is overloaded the bus driver's assistant will walk past police checkpoints with passengers that didn't have a seat. Cibihu lake is about 3 km downhill from the usual bus stop in Eryuan. Very few motorbikes for hire go to the lake, so if you walk in, expect to walk out. ClimbDali (大理攀岩), 393 Renmin Road, ☎ +86 131 50644701. 20 rock climbing routes have already been bolted (Shuanglang and Binchuan) with potential for hundreds more. Jizu Mountain (lit. Chicken Foot Mountain) (further away from Dali to the northeast behind Wase on the east side of Erhai Lake, take a bus (2 hours) from Xiaguans Eastern Bus Station to Binchuan（滨川）and from there change to a minibus or bus (1 hour)). The mountain and its ranges look like a chicken's foot. It's a 2-3 day trip in its own right. The top and slopes are covered in temples, many in a state of disrepair. Some have been restored and have resident monks. This is a difficult hike with the summit at 3200 metres. Be prepared. Or there are horse rides and a cable car that starts halfway up. Rice and Friends Cooking School Dali (米饭和朋友们), No.1 Hong Long Jing, Dali old town (meeting point is the Bad Monkey Bar, 59 Renmin Road), ☎ +86-151-2526-4065. Rice & Friends Chinese cooking school offers hands-on Chinese cooking courses, highly rated on tripadvisor. Beautiful open-air setup with mountain views. Authentic and very personal 5-hour cooking experience, including outdoor-market shopping for ingredients, introduction to the theory of Chinese cooking, hands-on preparation of 3 dishes with a recipe booklet to take away and plenty of time for everybody to sit down together and enjoy the meal they cooked themselves. Johnny 'O palm reading, @Tibetan Cafe, (Remin Lu, across from Bad Monkey Bar). every day at 16:00. The guy, that looks like a retired Super Mario with dark sunglasses, reads your palm and gives your an interesting perspective of what happened to you in the past. Won't tell you the future until you explicitly beg for it. Worth the ¥100 he's asking for. ¥100. Erhai Paradise (By Erhai Lake). Certainly worth a visit. It is a magical Buddhist haven with giant statues, empty amphitheaters, demon-statues, tea gardens and an artificial beach. One way is to hire a taxi driver form Dali or Xiaguan for the entire day and negotiate a price. The driver can take you to the boat jetty and show you onto the island ferry. You will sail across the lake. Explore the island and come back by boat, where your driver will be waiting to take you to a restaurant for dinner, or temples and bars as you wish. However this is really unnecessary as there is never a shortage of taxi drivers waiting at the ferry and the local bus service is extremely inexpensive and accessible. Buses are lined up and ready to take you back to Dali at an intersection 5 minutes walk down the road leading to the ferry. Total for the day about ¥500. Xiaguan Hot Springs (下关温泉) (from the train station take bus 21 (Bus 8 runs from the Old Town to the train station)). This swimming pool is called a hot springs resort because it probably really uses naturally hot water. Other than that it might be a little different from what most people might expect. These days it is a regular, pretty run down swimming pool (one pool on the inside, one on the outside, otherwise identical) with all the spa's (that are still on the price list) being closed. Interestingly there are places to stay in the resort with rooms around ¥280. ¥12. Peter's Tourist Center (李震票务中心), #65 Bo Ai Street, Dali Old Town, Yunnan,China中国 云南 大理古城 博爱路65号, ☎ +86 15125296978, e-mail: peter_lizhen@hotmail.com. Fluent English speaking with experience in arranging tours around Dali, especially cultural tours like Shaxi day tour and Yi, Bai, Hui minority markets and villages. Air, bus and train ticket booking, hotel and guest house booking. Dali has a number of famous local products. As ever, be prepared to bargain when shopping in Dali. See Yangshuo#Tourist stuff for advice on prices in Chinese tourist towns. Marble - Dali has exquisite marble (a little difficult to carry) which is carved into all sorts of products: vases, ashtrays, carved animals and more. The marble stone can also be cut and polished revealing pictures on the surface. These are known as chushi and can be bought framed, and these make beautiful wall decorations. Many people can mistake them for traditional Chinese paintings. Cheaper chushi, generally the white and grey type, cost ¥60 or more each. More expensive and coloured stone with clear mountain landscapes can be priced at ¥10,000 or more. The Chinese word for marble is Dalishi or Dali stone, indicating how famous Dali marble is throughout China. Tie-dye - The local tie-dye fashioned from dye and wax is also popular and cheap. One of the main production places is the Bai village Zhoucheng, about 40 minutes ride from Dali, which also has a nice daily small afternoon market and some nice old Bai houses. Embroidery - You can also purchase beautiful embroidery made by ethnic minorities, generally Miao minority from Guizhou Province, at a number of shops. The items include baby carriers, clothing or decorative patches that were attached to traditional costume. Teahouse - Dali has great teahouses. Relax in a teahouse regularly, buy a little tea and you will be welcome to come back at any time, with friends, usually for free. Sample new teas and as long as you buy something every so often, you will be welcomed again and again. Antiques - There are many antique shops very close to each other on Yù'ěr Lù (玉洱路). Start at the intersection of Yěyú Lù (叶榆路) and walk west. It can be very interesting to browse. Even if you're not a collector you may be tempted to buy something when you see how badly some of these treasures are being handled and stored. If you are looking for light bites or other daily needs with fair price without paying the "tourist price", check out the 'Si Fang Jie' supermarket, they have three branches in Dali Old Town (Fuxing Street, Yu'er Rd, and near North Gate). Alternatively, you may check 'Da Chang Sheng' supermarket at the junction of PingDeng Rd and Yu'er Rd. A bowl of noodle ranged between ¥10-15 (slightly more expensive than Kunming) (as of Jul 2019). Chinese meal served catering for four people along with beer expect to pay ¥80. Western meals average around ¥25, including a bottle of the local beer. Breakfast prix fixe menus are served everywhere and average around ¥25 including coffee. Fruit stands and corner stores abound. Try to get a feel for prices before buying if you want to avoid paying exorbitant prices. You can buy apples for ¥4/shijin (a half kilo), a bottle of water for ¥2 (as of July 2019). Try Rushan the local "Fried cheese" that is a crispy snack often wound around bamboo skewers. Available at restaurants or sometime street stalls. 再回首 (Zai Hui Shou), Renmin Road (walk east down Renmin Road just past Fuxing Road, traditional noodle stall on the left hand side). Spicy cold noodles with chicken strips, very well known locally. There is only one thing to order. 色了木 (Se Le Mu), Yu Er Road (walk east down Yu Er Road, just past Fuxing Road, open restaurant on the right hand side). The name literally means Salaam. Delightful eatery serving Dali Muslim food. Pictures are on the walls. Noodles only during breakfast hours while rice dishes are available for the rest of the day. Ask for chicken leg from the back kitchen. Golden Local-Style Noodles, Renmin Road (near Fuxing Road, several storefronts to the left of Bad Monkey). Noodle shop that specialized in Cross-the-Bridge Noodles, a local specialty where a bowl of hot broth is brought to the table, and then the rice noodles and a number of plates with small quantities of other foods is immediately added by the waiter. The menu is all in Chinese, but there are pictures displayed throughout, and ordering should be no problem. Vegetarian, Beef and Pork Dumplings, Renmin Road. Great place for fresh homemade dumplings. Nine dumplings with sauce just made and freshly steamed only cost ¥3.5. 25.688928100.1609611 Vegetarian Buffet (一然堂), Boai Road (north of Mingcheng Art Garden Hotel, just off of Boai Road). 11:30-13:00, 17:30-19:00. All-you-can-eat vegetarian buffet operated by Buddhists, the choices are usually four different vegetable dishes, soup, rice, and pickled vegetables. ¥5. Sun Island Cafe (太阳岛; Tàiyángdǎo), 324 Renmin Road (towards the East Gate), ☎ +86 872 2676075. A couple of steps away from the main tourist avenues lies this hybrid of Chinese and Japanese culture. This is the place to go for some genuine Japanese food cooked up the Chinese-, Japanese- and English-speaking owner or to relax to some chilled out music. The Japanese crew that manages the place might even throw a Jombei, Didgeridoo, Jews harp party which guests are more than welcome to join in on using any of the plentiful instruments. If the night creeps up on you after to many drinks or smokes then there is also a dormitory for ¥20 a night. Marley's Cafe, Huguo Road (Central Old Dali Town cross with boai), ☎ +86 872 2676651. Excellent first floor restaurant. Very good Bai dishes. Nice decor. Cheap and has a narrow balcony great for people watching. Om Shanti, 245 Renmin Road (East, down towards lake), ☎ +86 872 2679306. Vegetarian restaurant which serves great food and has a great, laid back atmosphere. The staff are very helpful too and can give you loads of helpful information. September, ☎ +86 872 2670266. Sichuan food. Dali Cookery School, East Gate Village, Dali Old Town, e-mail: dalicookeryschool@gmail.com. Why not try to cook several Chinese dishes? Great time and good food. Several courses available with four dishes in each. Visit the local market to buy all the fresh veggies. Can be booked direct or through several guesthouses in Dali. [dead link] Ruben's Belgian Waffles (红龙井比利时挖福饼; bǐlìshí wāfúbǐng), Corner of Fuxing Road and Honglong Jing (waterfall street), next to Dico's (红龙井和复兴路的十字路口,德克士旁边), ☎ +86 13577015005, e-mail: dali@wafubing.com. Open everyday from 14:00. This small waffle place, which is run by Belgian expat Ruben, offers delicious Belgian waffles, with several toppings available. The Sweet Tooth (Sweet Tooth 甜点屋; Sweet Tooth Tiándiǎnwū), 52 Boai Road (博爱路52号; Bó'àilù) (on a corner in Dali Old Town). This cafe specializes in pastries and desserts. The cafe is owned and operated by local hard-of-hearing people. Serves delicious and high quality desserts, coffee and milkshakes. Cafe de Jack (樱花园咖啡; Yīnghuāyuán Kāfēi), 82 Boai Road (博爱路82号; Bó'àilù), ☎ +86 872 2671572. Dali's oldest Western cafe. Has a fireplace, great apple pie, pleasant atmosphere and a great rooftop garden. While the menu is a little tired, the breakfast is good, as well as the chocolate cake and the lasagne. Spread over three levels, Cafe de Jack is the largest and most successful of the backpacker cafe/bars in Dali. Very popular with locals and travellers alike. The owners, local brothers Jack and Tim, are often on hand to provide good travel advice. Bakery 88 (88号西点店; 88hào Xīdiǎndiàn), 88 Boai Road (博爱路88号; Bó'àilù) (next to Cafe de Jack). This German-style bakery is easy to spot and has a great cake selection visible from the street. Run by a long term German resident, Karine, and is popular with both foreigners and locals. 25.693305199641100.159708857542 [dead link] Black Dragon Cafe (墨龙咖啡馆 mòlóng kāfēiguǎn), No.42 Centre Square, Foreigner Street 人街中心广场42号 (in the alley two doors down from Bakery 88), ☎ +86 13330556685, +86 872-2670535. 09:00 to late. The best coffee, and generous, mouth-watering meals - the wraps (chicken, beef, smoked tofu) are a speciality. A good selection of books to borrow or buy. Jim's Peace Cafe (大理吉姆和平饭店; Dàlǐ Jímǔhépíng Fàndiàn), Boai Road (With Jim's Guesthouse). Excellent Tibetan goulash, vegetarian or with yak meat. All-you-can-eat banquet for groups of four or more, ¥30 a head. Various other dishes. One of the town's oldest traveller hangouts. Old Dali Four Seasons Inn (四季客栈; Sìjì Kèzhàn), 55 Boai Road (博爱路55号; Bó'àilù) (near East Gate), ☎ +86 872 2670382. Great place to meet people and pick up travel tips; the Inn is a major backpacker hangout and people discusses their next expedition over breakfast. Has relocated and no longer provide all-you-can-eat breakfast. La Stella's Pizzeria (新星比萨房; Xīnxīng Bǐsàfáng), 21 Huguo Road, Dali Old Town (护国路21号, Hùguólù), ☎ +86 872 2679251. A well-run operation making generous portions of delicious woodfired pizzas, pastas, salads and Chinese dishes at good-value prices. They also have a wide selection of alcoholic beverages. The staff speak English, and there is a travel agent out the back of the three-storey restaurant. Worth a visit. LP café (咖啡), A18 Hong Longjing Road (红龙井A18号). It's the sort of place every neighbourhood would be lucky to have. The staff are friendly, the food thoughtfully composed and prepared. Serves deli style sandwiches and snacks made with high quality ingredients. Has a good selection of imported wine and liquors. Dali Wall Hump Garden (驼峰厨房-点苍虹鳟）. 53 Hong Long Jing. At the top of Hong Long Jing (waterfall street), right before the Hong Long Jing gate on the right. This newly opened restaurant specializing in Rainbow trout is set in a beautiful garden built over the remains of the original Dali wall. Dali's rainbow trout is considered the best in China, and spring water carried down from the mountains is used for every step of the cooking process. A 500 ml bottle of Dali Beer will cost you around ¥10-12 in a bar and about ¥4-5 from a grocer. A large selection of beer is on offer but some are coloured green and require an acquired taste. But for the price, there is no excuse not to sample the lot. Bad Monkey (坏猴子; Huàihóuzi), 59 Renmin Road, Dali Old Town (人民路59号; Rénmínlù). From 09:00. Dali's longest running foreign bar. It is hosted by two well-travelled Englishmen Carl and Scott who entertain guests before the dancing starts later in the evening with a Derek and Clive patter of jokes and one-liners. The Monkey is a magnet to foreign and Chinese travelers (many of whom seem to wander in and never leave), and remains popular with Dali locals. The bar has a pool table, dancing pole, a huge selection of local and imported beers and spirits (and their own pints of various Bad Monkey Beers on tap, made locally at the bar's microbrewery, and regular performances by bands and DJs. Bad Monkey also opens from 09:00 in the morning as a cafe, providing Western breakfasts; Thai, Indian, Chinese and Western cuisine are also available throughout the day. Daliba (大理吧; Dàlǐbā), 260 Renmin Road, Dali Old Town. The first flavoured vodka bar in China, owned by Vanessa from Guizhou province. More than 30 flavoured vodkas made by Vanessa and Kiki, beer and cocktails are available too! Sun Island Cafe (太阳岛). A relaxed place owned by A Chun, a friendly woman from Lin Cang. Well worth a visit for a few drinks, well worth a stay in the rooms they have for visitors in the courtyard. ClimbDali (大理攀岩), 393 RenMin Lu. Boulder bar offers free bouldering, cheap beer, and information on rock climbing around Dali. Also has an organic garden and pool table. 非常麻辣烫 (Fēicháng má là tàng), Xiaguan, Renminjie (下关，人民街） (it may be hard to find since this is deep territory, but well worth a trip into Xiaguan, so bring a Chinese friend if you can't speak any Chinese, though if not, then if coming from Old Town in the north, ask a taxi driver to take you to the intersection of Tiānbǎo lù（天宝路 and Rénmín nán jiē（人民南街, from there it's a short walk south and on the right hand side, although signs use its Chinese name). This restaurant/bar makes an evening trip to the south of the lake worth it. They offer extremely kitschy Revolution-era Chinese military and cultural memorabilia decor, as well as one of the most friendly and talkative owners in the area, but the main attraction is the food and booze. Try their various homemade flavoured liquors made from local fruit: the Plum Baijiu is a favourite (梅子酒). The food is unpretentious and delicious local comfort food: recommended are the stir-fried erkuai with peanuts and chives (炒饵块), and dumplings tossed in chili sauce. Vegetarian options are limited, though its still worth the trip as a strictly drinking place for those coming from the Old Town. This place may be closed and demolished. Neverland Cafe. On Bo Ai Lu has homemade wine and fruit wines, and needs your help in advising how to blend good wines. Great baked potatoes with tuna fish topping. Owner speaks English and listens to Billie Holiday. Dali has some of the cheapest accommodation options available in all China. Lots of accommodation to chose from. Expect to pay ¥15-30 for a dorm bed, ¥40 and above for rooms, ¥60-300 for a double room with private shower and toilet. Bird Nest (鸟窝), 22 Renmin Road (Tucked into a courtyard Bai house at the top of Renmin Road), ☎ +86 872 2661843. Very comfortable range of rooms from dorm beds, single, double and suite rooms to a private, 3-bedroom courtyard house with kitchen. Free Wi-Fi, 24-hour hot water, chill bar, good pizza and great Greek-style yogurt. ¥30-500. Dali Mingtong Yinxian Youth Hostel, Caicun Dock, Dali Old Town, ☎ +86 872 2691261, +86 13888635082. On the banks of Erhai Lake; there is an enjoyable view of the whole lake from the terrace on the third floor. Located in a Bai village, it is very quiet at night. Dorms ¥25, en suite doubles from ¥80. Dali Three Pagodas Youth Hostel (Hostelling International) (north-west of the old town, just west of the main road, a 5-minute walk away), ☎ +86 872 2666398, +86 13529651981, e-mail: yhadl@sohu.com. This hostel has friendly staff and is clean and pleasant. Courtyard and gardens. There is a large comfortable lounge with two PCs and free internet access, self-catering kitchen, roof terrace with great views and a travel service. The hostel is empty off-season. Dragonfly Hostel (清亭国际青年旅), 200 Pingdeng Rd (from train station or long distance bus station take the bus #8 to its terminal station then head south along Yeyu road for 500 m then at Pingdeng road turn left and walk for 100 m), ☎ +86 1800 872 4682. Owned by an experienced hostel staff from Chengdu's mix hostel and her Dutch-American husband. The hostel is inside the ancient city of Dali but far from the noise of the touristic spots. It was opened in 2014. Dorm beds have privacy curtains and extra wide IKEA beds. Cheap beers and large roof top area to smoke and eat BBQ. Suitable for long term stay. ¥25-165. Five Elements (五行客栈, wu xing ke zhan), Dali oldtown West Gate Dazhifang 69 or the west side of 214 Highway, opposite of Hong Long Jing gate, walk north for 50 m, or 500 m south of the West Gate, on your right side (Directions), ☎ +86-130-9985-0360, e-mail: fiveelementsdali@gmail.com. Facilities include: Staff are fluent in English and Japanese, comfortable rooms, organic food, freshly ground coffee each morning, clean spring water, convenient location (2-min walk to the town), and a beautiful garden area. There are two cute golden retriever dogs. Drinks are also available. Dorm bed: Starting at ¥15; a room with queen size bed: Starting at ¥90. Mama Naxi Guesthouse Dali (Joker's Guesthouse), 88 Fu An Alley. Ren Min Lu (walk to the East Gate on the Ren Ming Lu; go right after the No.5 guesthouse (should be on your right); you should also see Wang Jia Zhuang Hotel written on the wall at the end of the street; go there and then turn left; walk until you reach the end and turn right), ☎ +86 872 267 1168, +86 015198320421. This is the Mama Naxi in Dali offering the same services as the one in Lijiang. Clean comfy dorms, double and triple rooms. Quiet, convenient location with friendly, knowledgeable English-speaking staff. Free internet and Wi-Fi. Bike rental. Bus, train and airplane bookings. Discount tickets for local sights. Breakfast and family dinner. There is a nice courtyard to sit and meet other people. ¥20-. Higherland Inn, Zhonghe Temple, Cangshan Mountains, ☎ +86 872 2661599, +86 13988539680. Up in the Cang Mountains behind the Zhonghe Temple at 2600 m altitude, with a spectacular view of the lake and valley. Blissfully peaceful. A short cable car ride away from town. Great food, highly recommended for vegetarians. Booking advised. The Jade Emu and The Jade Roo International Guesthouses (outside the west wall, 5 minutes walk to the centre of town), ☎ +86 872 2677311, +86 13887232726, +86 15887399551, e-mail: reservations@jade-emu.com. The Jade Emu International Guesthouse was built in 2008 and the Jade Roo opened in 2010. The Jade Emu Guesthouse won the Hostelbookers Award for Excellence, 2010 - Top 3 Hostels/Guesthouses in Asia. They are run by Dave (from Australia) and his partner Song (from China). Double, twin/triple share, singles, family suites and dorm rooms available, all are modern, clean and comfortable. Facilities include spacious courtyard and rooftop balcony, Facebook access, pool table, table tennis table, Fussball table, bar/cafe with outdoor home theatre system, free internet (6 PCs including Wi-Fi throughout the buildings), satellite TV, printing/scanning facilities, laundry service and/or free access to a washing machine, electric bike rental, discounted tours. Guests staying for ４ weeks or more are given a 40% discount． Dorms from ¥20-40, private rooms from ¥55-150. Lee's Guesthouse, Dali Old Town, ☎ +86 872 2671385, +86 872 3156069, e-mail: cyclingdali@yahoo.com. Set up in 2008 and run by Lee's family from Inner Mongolia. It provides quality accommodation for backpackers. Cozy, clean and comfortable. Facilities include local Bai minority courtyard, mosquito-free accommodation, free internet & Wi-Fi, free movie, family dinner 19:00 (book one day ahead), fax/printing/scan, CD/DVD burning, laundry service, bike rental (shimano system), ¥1/min international call and travel agency. English spoken. Dorm rooms and double rooms ¥25-290. Rainbow‘s Nest International Guesthouse, 104 Guangwu Rd, Dali Old Town (two minutes from the center of Dali Old Town), ☎ +86 15808726740, +86 15125250972, e-mail: dalihappyhouse@gmail.com. Bai style house with six separate apartments each one equipped with living rooms, kitchens and private bathroom. Open sunny courtyard garden. Rooftop entertainment area and chill out room with free movies. Free laundry service, bike rental, comfortable and relaxed atmosphere. Free high speed internet and Wi-Fi. Traveler information and bookings. Staff are fluent in English and Chinese. Discount rates for weekly and monthly stay. Private rooms with living room and kitchen ¥130-150. Smile Cafe, Renmin Road, Dali Old Town (5 minutes further downhill from the tourist concentration), ☎ +86 872 2670565, e-mail: wangzhenchi@hotmail.com. 11:00-01:00. The young English-speaking couple that run Smile Cafe have befriended many a visitors with their laid back attitudes, approachability, and helpfulness. Cheap accommodation with nice rooms, laundry, free internet, hot water, courtyard with sun and table tennis, TV and DVD player. Dorms ¥25-30. TTF Cafe Hostel, 11 Luyu Road, Dali Old Town (大理古城绿玉路11号) (One minute walk on Luyu Road (绿玉路) from south end of Boai Road (博爱路) where intersects with Yita Road (一塔路)), ☎ +86 13988536165, e-mail: springzhfy@gmail.com. This may be the best bargain in the area. Free green tea, internet machine, Wi-Fi, 24-hr solar-hybrid hot shower, western-style toilet. Dorms and private rooms available. Dorms ¥15 (¥10 for members). Dali Private House, Dali Jiulong Ju A3-4 (opposite Gurong Hotel), ☎ +86 15894533443. Check-in: 14:00, check-out: 14:00. Private house to rent with all appliances provided. Discount for socially active tenants (baking cakes, helping in BBQ, painting, etc.) possible. 180. Jim's Tibetan Guest House, Bo Ai Lu 63 Dali Old Town, ☎ +86 872 2671822, e-mail: jimstibetanhotel@gmail.com. Very comfortable, clean and well appointed single and double rooms. Relaxed service. Downstairs is the cosy and good cafe & restaurant, Jim's Peace Cafe. They own another more upmarket place called Jim's Tibetan Hotel (see listing below). Owner Jim (a local) is a fluent English speaker and was the first local to start business with foreigners. With his Dutch wife he organizes great daytrips: trekkings, overland to Tibet, etc., can be found on their website. Bookings accepted by e-mail. Singles/doubles from ¥150. Koreana Guesthouse. This Korean-themed guesthouse is on the Foreign Street very close to the Chinese Construction Bank ATM. The staff is pleasant and well-trained and the manager speaks good English. They have Western toilets. They also provide a quick and free laundry service. Avoid rooms facing the street as they can be quite noisy in the evenings and mornings. ¥150-300. New No. 5 Guest House (down Renmin Road near East Gate). A nice, quiet spot on the East end of Old Town. Its rooftop deck claimsa very nice view of the area. English is spoken here, but the guests are typically Chinese. Affordable and clean. No. 3 Guesthouse, Huguo Road, ☎ +86 872 2664941. Nice, inexpensive, quiet option just outside the gates of the old town. The helpful staff speak Korean, Chinese and English and will accommodate most reasonable requests. Rooms on the second floor are pricier than those on the first. Restaurant on the first floor specializes in Korean fare but offers other dishes as well. Rooms are relatively clean. You should be able to bargain a double down to ¥70-80, including private bathroom. Tibetan Lodge, 58 Renmin Road, Dali Old Town, ☎ +86 872 2664177, +86 872 2678917. A guest house and restaurant with a lot of character and atmosphere. Cheap but with mediocre service. Sometimes no air-con. Room types available include singles, doubles, triples, family, and suites. Slow but free internet is provided (wireless or on very slow desktops in the lounge). The restaurant downstairs is good, but a little on the expensive side. Single rooms start at ¥39. Yu Yuan Guesthouse (A block West of the main tourist area), ☎ +86 872 2673267. Clean, with friendly English-speaking staff. Doubles with bathtub and electric blankets. The breakfast is good. Doubles ¥80 including breakfast. Jim's Tibetan Hotel, Yuxiu lu 13 yu yuan 4 (just outside the small South Gate in Dali Old Town), ☎ +86 872 2677824, +86 872 2440014, e-mail: jimstibetanhotel@gmail.com. Beautiful spacious rooms with colourful handmade furniture. Singles, doubles, 3- and 4-bed rooms and family rooms. Great garden, rooftop bar and terrace. Playground for kids. From ¥280 including breakfast. Same owner as Jim's Guesthouse (see above). Bookings accepted by e-mail. Dali Garden Bed & Breakfast (10 km north of Dali in a Bai minority farmers village; 2 km north of the B&B is the ancient town of Xizhuo with its Bai morning market and traditional Bai courtyard houses), ☎ +86 138 872 317 54, e-mail: Dali.Garden.BB@gmail.com. Dali Garden Bed & Breakfast is not a hotel or guesthouse. In the B&B you are the (local Bai/Dutch) owners' special guest and you can use also private parts of the house, such as the comfortable living room with TV. As you are their guests, service and hospitality have a high priority. The B&B is built in Bai architecture with European influence. The nice decorated guestrooms (doubles on first floor and twins on second floor) have modern Western facilities and an attached spacious bathroom with shower. One double on the third floor has a big terrace and a fantastic view over the village, lake and mountains. The price includes free pickup (with minimum stay of 2 nights) from Dali airport/express bus station, a welcome drink and snack, extensive Western breakfast, Yunnan coffee, tea, free use of bicycles, free Wi-Fi, all the mineral water, soft drinks and Dali beer you need during your stay and travel information. Landscape Hotel (大理古城兰林阁酒店; Dàlǐgǔchéng Lánlíngé Jiǔdiàn), Yu'er Road, Dali Old Town (大理古城玉洱路96号; Dàlǐgǔchéng Yùěrlù) (at the foot of Cang Mountain close to Erhai Lake), ☎ +86 872 2666188, fax: +86 872 2666189, e-mail: landscapehotel@sohu.com. Spacious rooms with internet access against surcharge. Business center, currency exchange, gift shop, ticket office, massage and sauna available. Chinese restaurant, coffee shop and room service. Listed rates for doubles from ¥460, discounted from ¥250, including breakfast. The Linden Centre, 5 Cheng Bei Xizhou (19 km north of Dali in timeless village of Xizhou), ☎ +86 872 2452988. In one of Southwest China's most pristine examples of traditional Bai architecture. Developed and managed by an American couple who has been involved in China since 1984, offers 14 upscale double rooms in the completely restored, nationally-protected villa. The centre also has a small museum, two restaurants, a cafe/bar, library, conference rooms, exercise room, and four elegant courtyards full of gardens and outdoor seating. 25.70184100.170981 Regent Hotel (大理风花雪月大酒店; Dàlǐ Fēnghuāxuěyuè Dàjiǔdiàn), Yu'er Road, Dali Old Town (大理古城玉洱路; Dàlǐgǔchéng Yùěrlù) (on Cang Mountain facing Erhai Lake), ☎ +86 872 2666666, fax: +86 872 2682082, e-mail: mail@regenthotel.cn. Five-star hotel in Bai architecture style. Very large rooms with free internet. Business center, currency exchange, gift shop, beauty salon, ticket office, karaoke, night club, billiards, table tennis, fitness, tennis, massage and outdoor swimming pool available. Chinese and Western restaurants as well as coffee shop and bar. The hotel comes with everything you can expect from a Chinese five star hotel, but lacks something in taste, service and Western breakfast compared to what you will find in larger cities. Listed rates for doubles ¥880-5,800 including breakfast. Linden Centre: in Xizhou, 20 km north of Dali. Lovely Bai architecture; very nice hosts and lovely surroundings. Very tasteful. ¥700 (incl breakfast). There are a few scams and petty crime targeting tourists in Dali. Watch your belongings carefully to protect from pickpockets and theft, though perhaps the major risk you take if staying in cheap accommodation is theft by other foreign travellers. Overall Dali is a very safe place with little crime directed at tourists. If you are planning to hike up the Cang mountains, travel in a group both to protect yourself from robbery and as back up in case of accident. Stay on the paths and don't take any risks climbing no matter how experienced you are, as fatal accidents do happen! Drugs disguised as strange artifacts are usually sold by women in traditional Bai costume, who will then lead you to their homes. Marijuana is still widespread, of course, but it is no longer tolerated in public. It is not uncommon to see marijuana growing in the wild. Women may also offer you "opium", but it is just worthless garbage, possibly sesame oil pressed with some unknown substance. While it is no longer easy to purchase marijuana in Dali, it can still easily be obtained from trail vendors in Tiger Leaping Gorge. Don't get your shoes fixed by men approaching you on the corner of Fu Xing Rd and Foreigner St. Even if a price is agreed, they will add a couple of extra stitches and charge ridiculously inflated prices (¥200-300). You're in a difficult position to argue because they have your shoes! Just go to a regular established shoe shop (there are several towards the east end of Renmin Rd) where you can get your shoes repaired well for less than ¥10. Most of the hostels and travel agents can organise bus tickets anywhere in Yunnan. They can also arrange flights farther afield. Many travelers from Kunming continue on from Dali to Lijiang. Consider taking the smaller bus through the mountains toward Jianchuan (can be picked up at the main bus station in Xiaguan - "New" Dali City). Get off the bus at the fork in the road in the village of Diannan (about 8 km south of Jianchuan). Get into a minibus and visit the Old Southern Silk Road town of Shaxi. The town has been well preserved and still holds much of its traditional character. The valley around it is littered with Qing and Ming Dynasty homes, bridges, theatres and temples. It is also the main jumping off point to visit the beautiful grottos at Shibaoshan. After your visit to Shaxi it is easy to continue your journey. A minibus from Shaxi or Shibaoshan can take you to the main bus station in Jianchuan. From there it is easy to get a bus on to Lijiang. This city travel guide to Dali has guide status. It has a variety of good, quality information including hotels, restaurants, attractions and travel details. Please contribute and help us make it a star!